I would appreciate any tips concerning re-coloring the letters on name rings. I just received a CZJ Triotar, and it's a real beauty but almost all the paint has vanished from the embossed letters on the name ring. I'd like to fix that. I'll need white and a little bit of red for the "T" coating. My first thought was enamel like I used to use for model kits when I was a kid, but I'd like to bet some advice before I try anything. I don't want to mar this beautiful lens. By "Embossed," do you mean raised lettering, or undercut(engraved or stamped)? The professional solution is to use fill in paints. They are fat paint sticks made specially for this purpose. I am using them constantly with very good results. Fill the embossed letters with the paint and wipe the excess, let them dry for one day and then clean the surface with a cloth with a bit of water and soap. It works perfectly and the paint, once dried completely, is very persistent, just like the original one. Indented, not raised. They're stamped, I would think. Thanks for the suggestions. That pen is exactly the sort of thing I was thinking of using. I'll look into it. Thank you. EDIT: They're not that expensive, either! You can use any waterproof paint. I used to use oil-based enamel, but now switched to acrylics . I used to use oil-based enamel, but now switched to acrylics. Acrylics? That's interesting. I would think acrylics would be less durable, but I suppose you can easily re-apply them. Yes very cheap in black, gold, red & yellow, but the white ones seem to be sold out from all the more local sellers. Not a critical improvement for any of my lenses, but I'm sure there will be quite a few that will improve in looks if I do get one. Hopefully I'll remember to check again after Christmas. Less durable in what way? Adhesion? I have crankbaits repainted using the same set (and clearcoated) and they hold together just fine in much tougher environment. Solvent resistance? There's hardly ever a reason to bring harsh solvent near a repainted (meaning post-CLA) front ring. But, yes, may be they are less durable. Time will tell. Well, the acrylics I've used solidify into a rubbery plastic. It's not really fragile, but it's not as hard as dried enamels. We may be thinking of different types of acrylics, however. How much wear-and-tear does a name ring get, anyway? Not that much unless you're removing it over and over to get to the front element or something, and that shouldn't be happening. I would say acrylics seem like a viable alternative to consider even if they are less durable. They're certainly less toxic if that's a factor. Thanks again for this suggestion, dan_. These things work great. Very fast and easy, apart from the drying time. They're like a big crayon. They have a hard crust on the outside (at least mine did) and you have to break through that to the softer paint inside. It's similar in consistency to thick cream cheese. 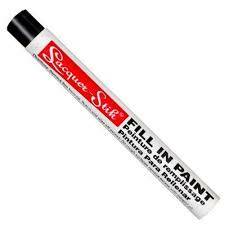 You smear it over the lettering, being sure to fill in all the cracks. The trick seems to be wiping off the excess. Use a fine cloth or tissue, not something rough like a bath towel, and wipe gently. The paint comes off easy, and you don't want to scrub it out of the lettering. I think I did a fairly poor job since it was my first time trying it, and the ring already looks quite good. Yes, that's the tricky part. I use wooden toothpicks to fill the letters and wipe the excess. Then an ear stick with wadding a bit wet and with a bit of soap to wipe around the letters (without touching them). I let the paint to dry (semi-dry, in fact) for one day and then it's easier to wipe the excess with a fine cloth or, even better, with some paper a bit wet and with a bit of soap (not to smear the paint inside the letters). I suppose the lettering is engraved, not simply silk-screen printed. You can use nail polish or wood paint, which exist in all colors, to restore the worn paint in the grooves. Apply nail polish or paint with a small brush without worrying too much if you get some paint out of the groove. Wait until it almost completely dry and remove the excess with a cloth folded multiple times and slightly soaked with solvent/remover. The result is suprisingly good. There was a big particle of something inside the front element so I removed the ring again in order to blow it away. While I had it off the lens, I thought I'd snap a shot to post. Like I said, I think I did a poor job just because it was my first time using this technique suggested by dan. I'm leaving it the way it is though, because I actually think it looks appropriate for a 70-year-old lens. When I started the ring was almost completely black with virtually none of the original lettering remaining. This was really fast and really easy, and when I do it again I should be able to get a near perfect result since I know what I'm doing now.